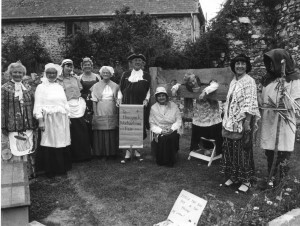 A Michaelmas Fair held in the castle grounds on the 27th. 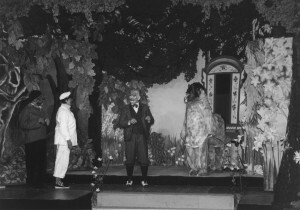 September 1986. 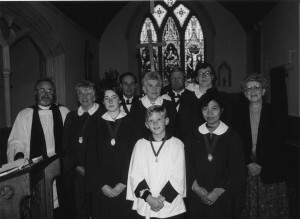 L to R.
Hemyock Church Choir in the 1990’s. St. Mary’s Church Choir in the early 1990s L to R.
Back row Rev. Tony Grosse, Polly Eden, Rebekah Bawler, Peter Reed, Olive Goodman, David Palmer and Joan Lawrence with Stuart Summers and Betty Petch in front.